It's been six hours since our plane landed in Legazpi Airport. 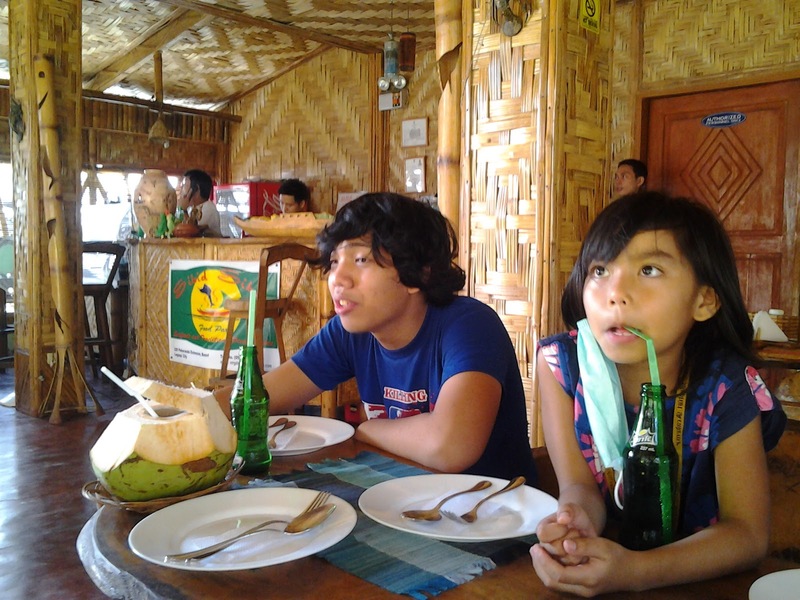 We had breakfast at Bigg's Diner, went around the town of Daraga, visited Cagsawa Ruins National Park, had an awesome family adventure at Lignon Hill and had ATV rides to Mayon Volcano, huhhh! This is what we like about this rural town, it is easy to go around places here. Not minding the small tricycle that we have to ride all four of us girls snuggled together with our bags and the two men of the family at the back of the driver. It was a first for all of us. Also, drivers know where the tourist places are, though finding a cab may be a bit difficult be mindful of how the tricycle drivers would ask for a fare. So let us now proceed with our lunch for that day. Initially we had the tricycle stop at Waway's. 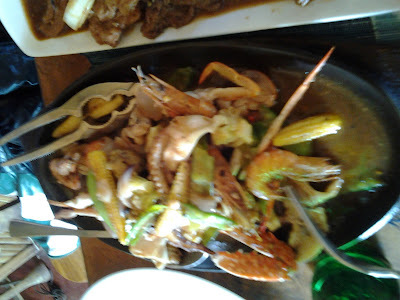 Known to serve authentic Bicolano dishes, this was on my list. However, due to the expensive adventure we had that morning we ran out of cash. On my wallet are hundred bills amounting to P600 only. Since we are all famished, we thought that it might not be enough. They don't accept credit cards as well so we had to go and find another place to eat lunch. Someone recommended Sibid-Sibid which is on the other side of the street. 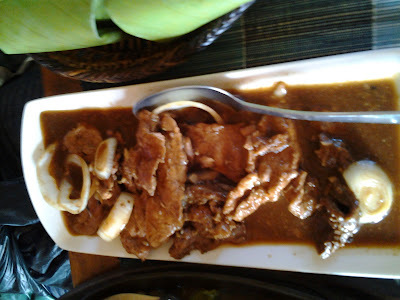 Going through my list, Sibid-sibid is also a choice for Bicolandia food-gawking. So off we went there, but my husband decided to look for an ATM machine just in case. He left us for on a tricycle ride while I tended my kids' orders. As you can see it's pretty much obvious that we still are in the Philippines. 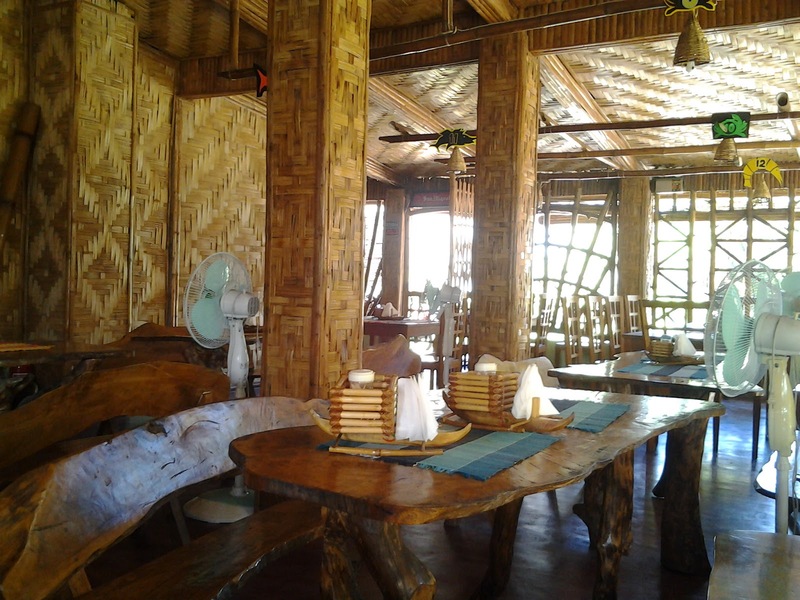 The whole place is very native with long wooden chairs and tables, bamboo stilt braces, under a comfortable and relaxing nipa house. 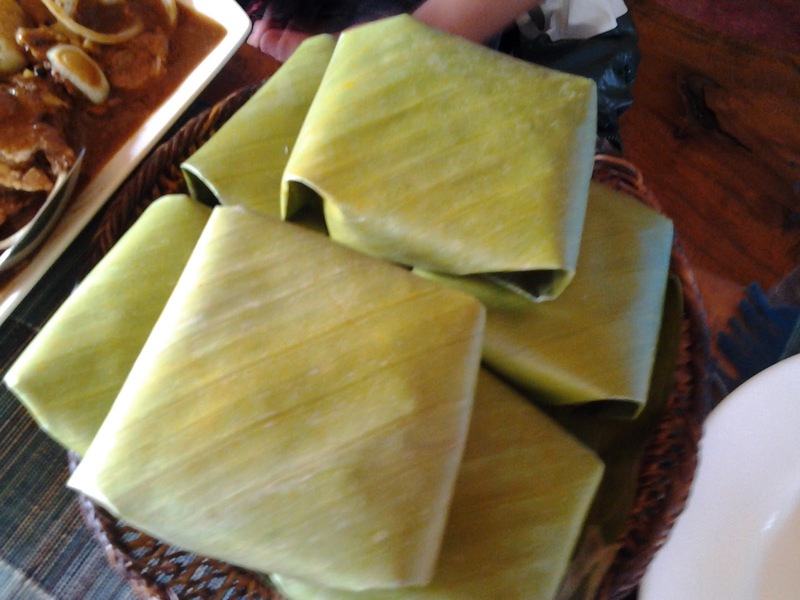 Wait this is not, meryenda...nor this is suman for later. This are steamed rice pocketed on banana leaves. And check out the basket dishes used to carry our packed rice with, very Filipiniana. We had the Bistek. it's named in Bicolano, but I can't remember. Also the sizzling mixed seafood. Everything was ok, but my son said, "I thought we are here for Bicol Express, Laing and Bicol dishes?" I thought so too, felt bad anyhow not having Waway's till the last dish came. Ahh I still can't remember the name. 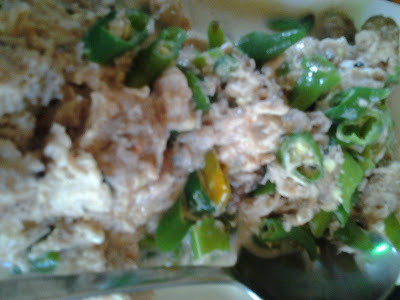 But it's their version of Bicol Express, except it's not pork but tuna fish fillets, cooked just right with the excruciating, tounge-tingling spicy Bicol dish we were expecting. And we were all happy, except my Dana who didn't get her Calamares, since we ordered but they didn't prepare it, so that's a failing mark on their service rate. 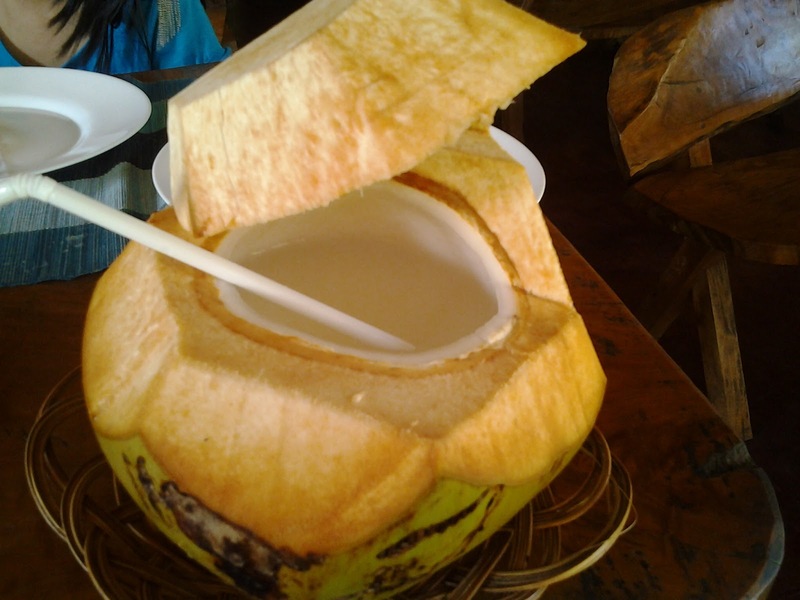 But I would still recommend this, especially if you fancy seafood dishes, with gata (coconut milk sauce). Prices are affordable. Each order of a dish can be shared with two to three persons. Sorry about the not-so-good photos, we finished up all our batteries, from DSLR, cybershot, even our phones were almost dead. My daughter's Samsung smartphone was used to catch the images. After that we went back to Balay De La Rama for an afternoon shut eye's. The interiors make it look like an old-school bahay-bakasyunan typical of Southern Luzon. Oh, and the food looks wonderful. Incidentally, believe it or not, some Bicolano friends of mine told me that bistek IS actually a specialty of some towns in the region; it's a great way of preparing the local carabeef, I think.